When NASA meteor expert Bill Cooke arrived at the Marshall Space Flight Center and checked his email Sept. 9, 2008, he was very surprised to learn that he'd slept through a dramatic event. A flurry of shooting stars had lit up the pre-dawn skies, including more than two dozen fireballs brighter than Venus. Cooke's all-sky Sentinel camera recorded the whole thing and had left him an email summarizing the outburst. "Our Sentinel system consists of a computer-controlled camera, fisheye lens and digital video recorder," Cooke explained. "It was developed by researchers at the University of Western Ontario for studies of meteors over Canada, and now we've adapted it for our purposes. Every night, Sentinel patrols the sky, looking for the unexpected, and it never gets sleepy." An annual meteor shower around Sept. 9 was known to scientists, but it has always involved a few dim streaks coming from the constellation Perseus. It is called the September Perseids, and it had never measured up to the more dramatic August Perseid meteor shower. So few if any meteor enthusiasts ever bothered to watch the September event. "Now we know better," Cooke said in a statement yesterday. 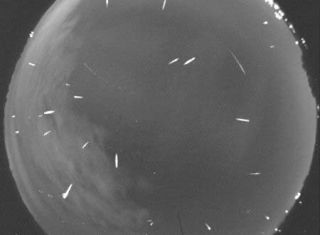 "The September Perseids of 2008 were fantastic." A meteor shower is typically generated by debris left behind by a comet -- grains of ice and dirt ranging from the size of sand grains to peas. The comet responsible for the September Perseids is unknown, but it must have laid down multiple debris streams as it orbited the sun. This year, Earth ran into a denser stream, Cooke figures. There could be many unknown streams of debris crossing Earth's orbit, in fact. "We can discover new meteoroid streams that could pose a threat to spacecraft and satellites -- or just put on a pretty show from time to time," Cooke said. Cooke's team has since set up a second camera, 100 miles away, to make the Sentinel system able to determine the direction from which a meteor comes. This would allow scientists to figure out the orbit of the comet involved. The first successful test of the two-station Sentinel system came on Oct. 1, when a centimeter-sized meteoroid hit Earth's atmosphere over the southeastern United States with about as much energy as 500 pounds of TNT. Both cameras recorded the fireball. Using software developed by Rob Weryk of the University of Western Ontario, the Sentinel system automatically calculated the orbit of the meteoroid and emailed the results to Cooke. "It came from the asteroid belt," he said.